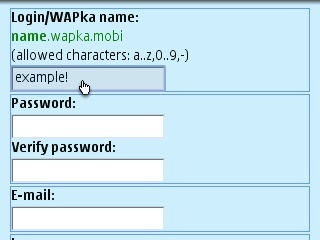 Address of your WAP site will be:- www.login.wapka.mobi ! 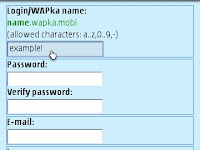 How to Register on Wapka? At first enter - Wapka.Mobi . Then click on Register and complete Registration giving all fields. 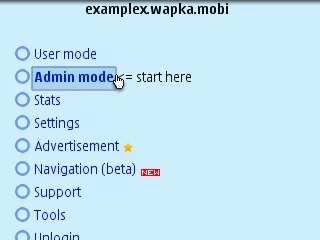 Then enter Admin mode . 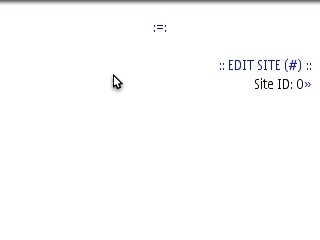 Your site is created !!!!!! Test it now! How you will edit your site ? You will see after login in Admin mode of your site. You Have to enter ::EDIT SITE#:: link. And you will get a layout of options. Select one for Start editing like Link or Text. Putr the text or link Address in the field and Submit. You will see the result in your page ! 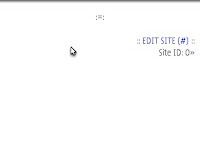 Enter ::EDITSITE#:: and select lat option named- More Advanced Functions and learn how to Design your Wapsite. Its like Magic. Have a fun ! Bye. I love your blog ... But it was very sad that you been working with this kind of theme ... Just make this blog more user-friendly and attractive . If you want to make this blog attractive just contact me . Dear Sir , i"m logging on to wapka,then i clicking on Admin mode,but then showing HTTP Error 404 - File or Directory not found . Please tell me how can i publish and cvreate my wapka site..
at first i create wapsite on wapka platform but now i want to leave from wapka. but my wapka site i don't want to delete. because that is my first wapsite. Earn 10000-50000/- monthly by working 2-4 hours per day. Its Government Registered company,contact me on WhatsApp i'll provide u all legal documents. I have been surfing for hours and I have not come across such an interesting blog. Additionally, the tutorial has been explained well and the reader has an easy time reading through it. Thanks for sharing such a high –quality article with us and you can check out my article by clicking on Simple Steps to Writing an Outstanding Research Paper.